It was a slow week on the blog. We are without a Kindness Investor to share a daily story of giving from some part of the world. If you or someone you know are out of work or underemployed and would like to become a Kindness Investor for seven days, shoot me a message! My blog today is a special one. I recently was honored to be invited to visit Atlanta to speak at the 95th anniversary event for the Junior League of Atlanta (JLA). In case you are not familiar with the Junior League, it’s an organization made up of outstanding women who are committed to promoting voluntarism, developing the potential of women, and improving the community through the effective action and leadership of trained volunteers. Its purpose is exclusively educational and charitable. They have a little less than 2,000 active members in the Greater Atlanta region who last year collectively volunteered more than 90,000 hours at 95 different organizations saving them more than $1.8 million in labor related expenses. That is awesome! My speech was in the evening and so I had some time to visit first hand some of the work that JLA’s members are involved with. I was met by Audra Dial, JLA’s current president. She accompanied me to three spectacular organizations where JLA works. Audra, a partner at a top law firm, is a truly inspiring individual. In addition to her professional and philanthropic work, she’s married and is the mother of a handsome 18-month-old boy! People often ask me how I do all that I do, well, I want to know how the heck she does everything that she does! The first organization we visited was My Sister’s House a 264 bed facility that offers overnight shelter and residential discipleship programs for homeless women and women with children. Part of the Atltanta Mission, My Sister’s House also provides counselors, referrals to job training programs, and help in finding housing, medical and legal resources. For mothers, the organization has a fully developed childcare facility staffed with a behavioral specialists and social workers. Melissa, the manager of volunteer services, greeted us and showed us around. I was very impressed with the facilities, especially the part that houses single women and women with children for up to a year. They have simple yet comfortable apartments that they call home. The housing and services are provided free of charge to the women and their children, however, each woman is required to contribute in some way. Some do laundry, others clean the general facility rooms or help provide the more than 500 meals that are served daily. This appears to be a very well run organization that is full of love. It was sad to leave, but we had a few other places to visit. 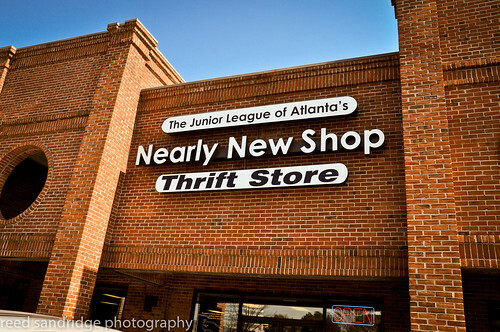 Next it was the Nearly New Shop, a store that is run by JLA as a source of fundraising for the organization. “We’re somewhere between a thrift store and a consignment shop,” Scott, the store manager, explained to me. I walked through the neatly organized store and wandered over to the men’s clothing. A charcoal Brooks Brothers suit caught my eye, but it wasn’t my size! Everyone working here is extremely warm and caring. Jackie, a JLA volunteer, warmed my heart with her smile and calming voice. 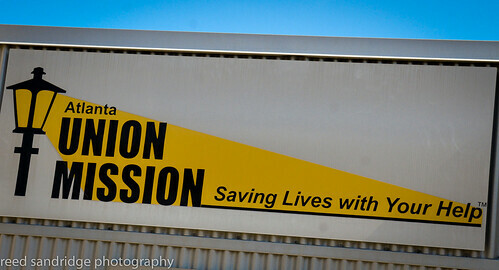 “We are always in need of donation items in good condition,” Scott mentioned as he showed me around the storage area. “Especially furniture and men’s clothing,” Jackie added. 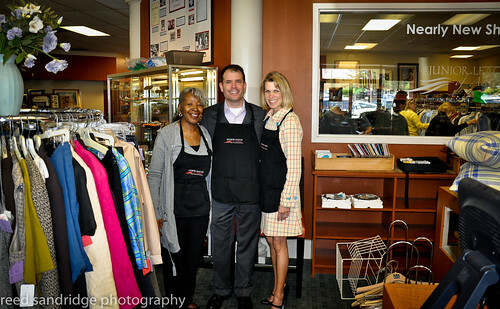 Jackie, Reed and Audra at the Nearly New Shop. about language and literacy that made me wish I had taken notes. 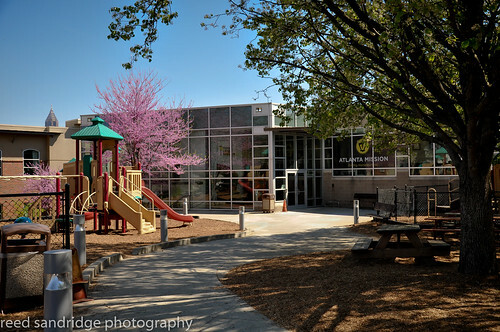 If you would like to support this vibrant learning facility please click here. I ended up back at my hotel for a quick shower before heading over to the beautiful Ahavath Achim Synagogue where I delivered my speech. The evening presented two “firsts” for me. It marked the first time I have given a speech in a synagogue and the first time I have been the only man in a room with nearly 500 women! I want to thank Audra, Sara, Deb and all the members of JLA. I truly felt the southern hospitality! If you want to learn more about JLA or support their terrific work, please click here. Another excellent blog, Reed! You give such a wonderful description of the JLA program! I had mentioned previously that I have a friend from Brentwood, TN, which is where your last kindness investor came from… this friend is moving to Atlanta soon and I’m pretty sure will be interestedin the JLA. I’ll be sending her a copy of this blog! You described everything but what you spoke about to the group. Was it about your Year of Giving project? It was very generous of you to give your time and money to go all the way to Atlanta to speak to this group. I’m sure they appreciated it! Thanks for the kind words. I gave a talk about my year-long experience. And just to clarify, JLA covered costs of the trip. It was a great experience and I was amazed at how benevolent these women are. Do tell your friend to look them up when she gets to Atlanta! What an excellent blog! I am glad I discovered it. Volunteer work is a way to build skills, feel good and help others. With rising unemployment, people are starting to realize the value of volunteer work and helping out. As they need help, they recognize others were there to give it. In turn, spare time is turned into an ability to reach out and volunteer to help others. Good job Reed! Sounds like you are really enjoying this volunteer effort.